← IS THIS WHY REP. STEVE SCALISE WAS SHOT TODAY? the swamp … and to threaten whoever tries to drain it”. Robert Mueller is a creation of Deep State. He’s a cold-blooded swamp creature whose primary objective is to overthrow the Trump presidency. Rosenstein was ordered to make this specific appointment by his masters in Deep State. Otherwise, why would he have picked Robert Mueller — of all individuals — out of a field of many other other much more qualified, and far less conflicted, candidates? The conflicts that exist with the Mueller appointment are so numerous and obvious that such a reckless move must have been engineered from the very top of Deep State. Hence, this duplicitous maneuver was foisted on Rosenstein, who was likely compelled and/or coerced to follow through. He is, after all, just another pawn of Deep State whose career success depends on following their commands. To disobey in such matters is to risk one’s family and even one’s life. Given the extremely ominous developments thus far regarding the constitution of Mueller’s team, the Special Counsel must be terminated post-haste. Likewise, Rosenstein must be fired for his transparent collusion with the Democrats. But it’s Mueller’s flagrant flouting of the “rules” pertaining to conflicts which make him so dangerous. Where it concerns draining the swamp, purging the nation’s top law enforcement entity of all criminal elements reigns supreme. 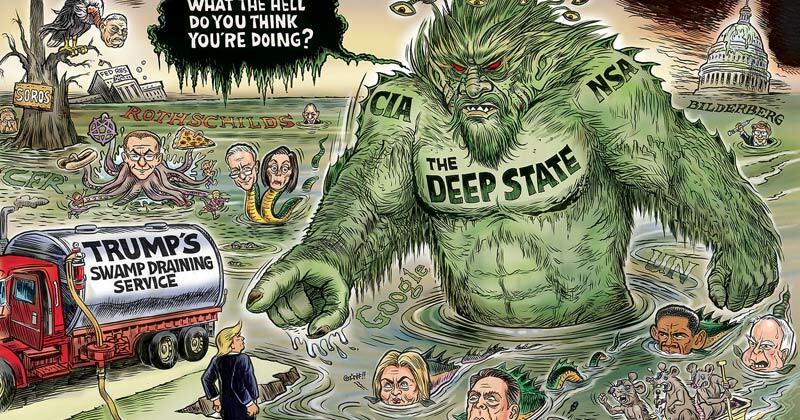 Deep State has always used the FBI, DEA, CIA, and the DHS to protect its many covert operations and rogue agents throughout the U.S. Federal Government. The directorships of James B. Comey and Robert Mueller at the FBI both stand as a testament to this stark reality. In view of this dire predicament for President Trump, Mueller must be relieved of his duties immediately. Not to do so puts the entire Trump administration in harm’s way. A traitor only knows how to commit treason. Both Mueller and Comey are two peas in a pod and have proven repeatedly that they cannot be trusted. Since Mueller received the appointment, he has only confirmed that he is nothing but a political hack who will make much mischief for Trump. Each individual who Mueller has added to his team is but another Democrat political operative whose agendas put the White House in great jeopardy. Their explicit purpose is to fabricate more false evidence against the POTUS and his key staff. About this there can be no doubt. Therefore, it behooves Trump to swiftly torpedo their fraudulent operation. Every day that Mueller has to further constitute his team, the more difficult it will be to terminate this treacherous initiative aggressively pushed by the DNC. Some of the nation’s best comedy acts have come in pairs. Stiller & Meara. Martin & Lewis. Laurel & Hardy. Abbott & Costello. Hope & Crosby. Cheech & Chong. Now we have Comey & Mueller. 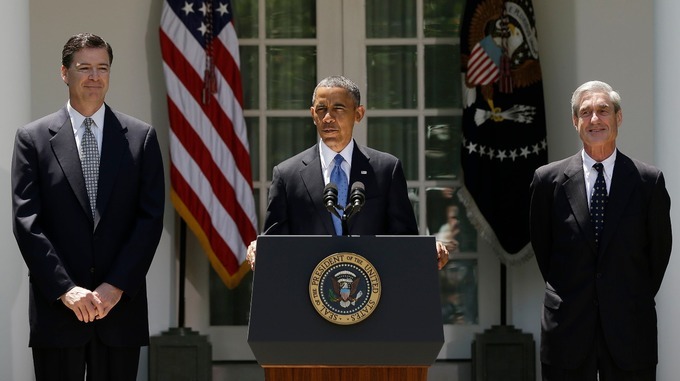 Mueller & Comey: Just who are these two clowns? As for Mueller, he got away with his comedy act for 12 straight years by deceitfully hiding behind the high office. The official record of the FBI’s investigation of the 9/11 crime scene and coverup during his tenure is so woefully lacking and full of holes; you have to laugh at the utter stupidity of it all. Of course, that the U.S. citizenry let him BS them for so long really makes you want to cry. Perhaps this is really why Mueller now finds himself appointed as Special Counsel to the most radioactive and bogus investigation in modern history. His whole act and MO have now been placed under the microscope of the Alt Media’s intense scrutiny and fact-finding. That he got away with the naked cover-up of 9/11 is quite incredible; however, he will not get away with the impeachment of Donald Trump. And that is his explicit purpose—to find any actionable evidence whatsoever by which to impeach the POTUS. Even while U.S. Attorney in San Francisco, Mueller worked to cover-up the Oklahoma City bombing, Waco, and Ruby Ridge evidence by changing the rules of evidence so that the FBI and prosecution did not have to share as much evidence with defense attorneys in the cases as would have been required in the past. He changed the Brady rules of evidence in concert with the U.S. prosecutor Beth Wilkinson in the McVeigh and Nichols case who had assumed a position in the same department at Department of Justice that Mueller had worked earlier. Mueller was brought into D.C. to head the transition team for Ashcroft, whereupon he proceeded to steer Ashcroft through the cover-ups by FBI and DOJ on the Oklahoma City bombing case. Mueller did such a superb job that Ashcroft personally nominated Mueller to Bush for FBI director to help perpetuate the FBI and DOJ cover-ups of Waco, Ruby Ridge, and the Oklahoma City bombing. Will they end up hanging themselves instead of the POTUS? Undeniably, Special Counsel Mueller is putting together an extremely powerful political assassination team. It’s quite possible that this assemblage of political hitmen will unwittingly sabotage their own efforts in the end. Just as former FBI Director Comey has forever destroyed his own credibility, it’s quite likely that Mueller et al. will do the same so blinded are they by partisanship. Really, what good can possibly come from such a conspicuous witch hunt? The Democratic hatred for Trump has been so blinding, in fact, that none of them — nor their surrogates — appear to see the fast approaching cliff. Since the election, the Democrats are acting like a pack of lemmings insanely running over a cliff to their political demise. Does Trump give Mueller just enough rope to hang himself and his cohorts? Or, does he cut bait and get back to implementing his agenda? For sure, Candidate Trump’s number one campaign promise was to “Drain the swamp!” Maybe that’s what he’s really doing–fulfilling his most important campaign pledge to get rid of the worst swamp monsters. As long as they run their tyranny inside the Beltway, what can realistically be accomplished, even by a sitting POTUS. Nevertheless, Mueller will do whatever he can to refill the swamp, thereby protecting all of his fellow swamp monsters. They all throng together, don’t they, since they require each other for their gang-fighting and mutual protection. (Just like Comey was Clintons’ inside man for so many years.) Therefore, it would appear that Trump needs to quickly remember his favorite line from The Appentice—“You’re fired!” That is, before they get him fired.